It’s always interesting to me the memories we hold onto as we get older. Some of them are near and dear to our hearts whereas others bring back the ping of pain in our guts as we remember every single vivid detail. I remember what it felt like to hold my daughter for the first time as if it was yesterday – not 16 years ago – and I can still feel the fear I felt when my son was born and refused to breathe for the first 30 seconds of his life. Beyond the precious memories that warm our hearts and make us thankful for our gifts, those odd memories of events passed often stick with us, too, and sometimes, for way too long. I can clearly remember my 8-year old self standing on the playground, crying because a classmate stole the Michael Jackson pin that was secured to my school uniform jumper. I will never forget the look on my sister’s face when she pushed my guilty classmate up against the brick wall of the school and tore it off his shirt so I could have it back. I have no idea why the events of this day have stuck with me for more than 30 years, but every time I run into him in the store or see him post a picture on social media, the events of that day come flooding back into my mind and I can’t help but still blame him for his actions. Although this event was devastating at the time, it should be insignificant to me now after enduring the deaths of loved ones and tragedies that are far more devastating. But, for some reason, the small stuff can consume our minds, forcing us to hold on to grudges and events that are probably long forgotten by everyone else. Grudges can consume us and take away our power to be happy. Holding on to someone’s choices from years ago and the built up hurt and anger that has festered over the years can be emotionally, physically and spiritually damaging. Anger and bitterness takes away our own power and transfers it to someone else. It gives another person’s actions control over our future decisions and most of all, our happiness. Would it help to remind those who hurt us and demand an apology for their actions? Would it help to demand that this person change, seek forgiveness and rectify the situation? Probably not. The reality is that we can’t change anyone but ourselves. What would help is to let it go and give it to God. By releasing the power of that grudge and handing it over to a higher power, we not only teach our children the necessary act of forgiveness, but we also learn how to trust our faith to help us through those tough times. I may still remember that day vividly when my precious possession was stolen and I may still remember the hurt I felt every time someone said a harsh word to me or betrayed my trust over the years, but I don’t have to hold on to the feelings I felt and I certainly don’t have to relive the pain over and over again. 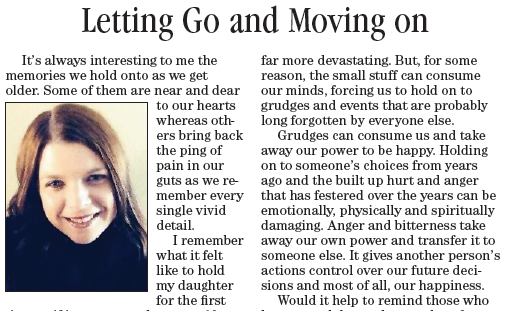 Instead, I can let it go, move on and know that it is no longer in my hands. I’ve handed it over to my faith and my faith has never failed me.